A pixel in a liquid crystal display is a thin multilayered sandwich of many components, as shown in Figure 8. It has two horizontal polarizers, one at the back and the other in front. In between these two, is a sandwich of electrodes and liquid crystals. 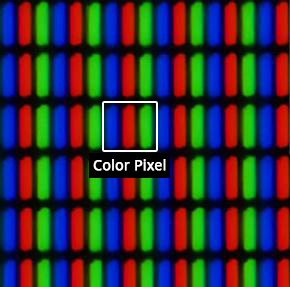 All pixels in an LCD are illuminated using an unpolarized light source, such as an LED. Brightness: The light from the light source passes through the back polarizer and becomes horizontally polarized. When the slider in Figure 8 is at the extreme left, no voltage is applied between the electrodes, and the liquid crystals rotate the polarization of this light by 90 degrees. However, this vertically polarized light is completely blocked by the horizontal polarizer in the front and we see a dark (black) pixel. Now move the slider to the extreme right to apply the maximum voltage between the electrodes. The resulting electric field is strong and it causes the horizontally polarized light to pass through the liquid crystal unchanged. It then passes through the front polarizer unhindered and we see a bright (white) pixel. To display shades of gray, use the slider to apply a partial voltage between the electrodes. The beauty of this system is that the brightness of each pixel can be chosen by simply controlling the voltage applied to it, without the use of moving parts. Color: Displaying color in an LCD is simple. Each pixel is physically divided into three smaller sub-pixels, as shown in Figure 9. The three sub-pixels are covered with red, green and blue filters and are used to display the brightnesses of the red, green and blue components of light, respectively. Although the sub-pixels operate as independent pixels, given their tiny size and proximity, our eyes will fail to distinguish them as separate pixels. Instead of seeing three separate pixels, we perceive them as one pixel emanating a combination of red, green and blue light. As we described in Image Sensors, virtually all the colors we sense in the real world can be produced using different combinations of red, green and blue light. "Liquid crystal display," [Online]. Available: http://en.wikipedia.org/wiki/Liquid_crystal_display.